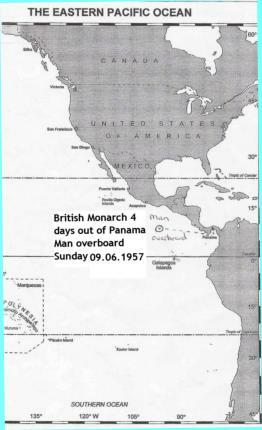 Sunday 9th June 1957, four days out from Panama, which was a 1000-mile’s behind us. We are bound for Japan with a cargo of Soya Beans from Cuba. Beautiful morning and it's breakfast time – the best meal of the day. Cornflakes, bacon and eggs, toast and coffee, nearly over and no sign of Doug the 2nd Mate, dieting I thought – lets rub it in. Not in his cabin – up to the Bridge where I questioned the 3rd mate – “Not here Sparks he must be aft checking the Log (A line aft registering out speed and distance) – it was giving trouble yesterday.” Ambling off to I went to the stern of the ship – No sign – back to the Bridge again – “Where is he hiding 3/O” – “try the engine room he might be cadging the engineers for some help” he said. Down the engine room I went – don’t ask me why! – NO!, the 2nd Engineer (Victoria Drummond) had not seen him either. I was now getting really worried and back on the Bridge I told the 3rd mate of my suspicions – “I can’t find him anywhere – reckon he is not on the ship”. “Don’t be daft Sparks he must be around somewhere,” he replied. “Think we ought to tell the Old Man”, I said. “You’re balmy, you tell him yourself”. Down I went to Capt. Coutts, who was taking his morning constitutional on the boat deck. “Morning Capt.” I said “Sorry but I have got to report that I do not think that the 2nd mate is aboard, I can’t find him anywhere” and I explained all that happened. 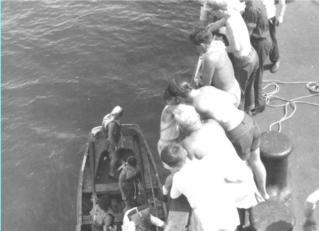 He thought it a little strange but decided to call all hands for a thorough search of the ship, Lifeboats, lockers, spare cabins, forecastle, stering flat, engine room and even down in the cargo holds. Definitely no sign of Doug. Last reported sighting was at 4 a.m. when he handed over the watch to the mate. 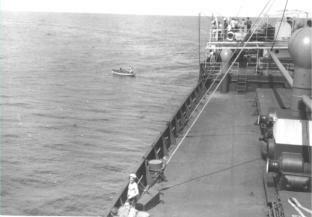 It was now 9 a.m. five hours at ll knots - that was 55 miles of shark and barracuda infested water. Some hope for poor old Doug, but if you are a sailor, you believe in the Almighty and Miracles. Around we turned, back along the invisible tract we had come, or near as humanly possible. Everyone not on watch manned the look out positions. In the Radio Room I got the transmitter on the air and sent off an emergency signal to all ships in the area, telling them of our loss and giving our 4 a.m. and 9 a.m. positions and course. 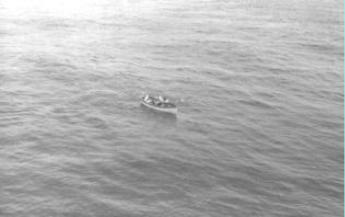 Several ships replied and one shore station from a little State on the isthmus offered the help of their only plane, if we could give them a definite area as it was a long way to fly and insufficient capacity for a long search. We thanked them and said we would keep them informed. It was nearly mid day now, with the sun high and a long swell causing the water to flash like a tell tale signal from the deep. Porpoise broke the surface – or was it sharks? No news from the watching ships, nor from the silent men, young and old eyes, keen and experienced, watching for that bobbing head, such a small size in such a great ocean. 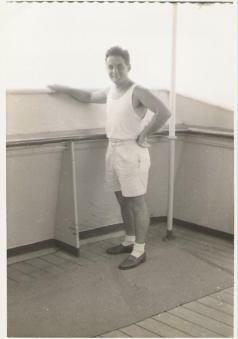 At noon, the mate, Mr. Love, took over the bridge watch and he and Capt. Coutts had a discussion and decided the prevailing wind and currents had been a certain way and corrected for this by a six-degree turn to Starboard. Little did we realise what a significant change this would make? On we steamed for another hour; soon we would reach the end of our track. “There is a man swimming on the starboard side,” cried the 3rd mate from the Monkey Island. “Where” shouted all hands? “There” he pointed. Yes there was our Doug! Way over on the starboard side, a little black blob, believe it or not, waving his arms! “All stop” shouted the Captain, engine telegraphs rang and before we had, the mate had a boat launched and was heading towards our lost shipmate. Even then he could have been taken from us – sharks and scavengers, follow ships, we could have been bringing danger as well as safety. But no! All was well and into the boat he was pulled. Our boat was soon alongside and up the pilot ladder came our bionic man. Where did he get the energy after over nine hours in the water, competing with goodness knows what. Once on the firm deck, he gave to his tired body and collapsed. He was soon bundled into the hospital bunk and tucked up blankets but his strength returned to clout the Captain a fourpenny one when he put in a hot water bottle. We later found out he thought it was another stinging “Portuguese man o war” (a large jellyfish). We were once again a complete crew and back on our track to Japan! We told the watching ships of our good news and thanked them, together with our friendly state with the one plane. They all were as excited as our selves with our great news. 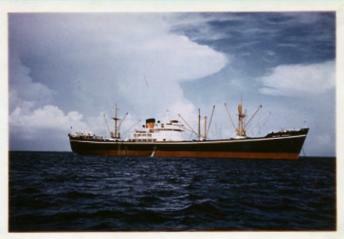 A message was sent to our owners, the Monarch Steamship Company, telling them we had lost our 2nd mate but had found him again and were carrying on to Japan. That was that, I thought - but that was the beginning of a lot of work for me. Next radio watch there was telegrams galore for the “British Monarch”. The whole world wanted to know what had happened. Congratulations came from our owners and numerous others including newspapers, some requiring reply paid messages to 500 words others requiring a 1000 words. Captain Coutts tried to compile a story from Doug’s ramblings about being attacked by birds, large jellyfish, other strange fish and his one friendly giant turtle. But it was not the real story. “Don’t worry Capt.” I said. “Leave it until Doug can write when he recovers, it will be good therapy for him and it is his story they all want to hear and will be news any time”. When he had recovered, Doug wrote his incredible story. On reflection, if the Captain and mate had not altered those 6 degrees, if he had not been missed until later, and he did not have such a strong will power and we all had not such faith – what a different story it would have been. It is nice to know the days of miracles have not passed.